The IT market in Israel includes all the import of computer hardware and software, local software development, software projects and auxiliary services of the computer industry. 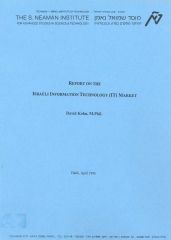 In 1995 the Israeli IT market was evaluated at US$ 2 billion, 0.5% of the world market. Hardware import amounts to US$ 506.3 million and software imports, to US$ 100 million. The total Canadian import amounts to 0.007%. The export of software was US$ 250 million, about 26% of sales. The share of Canada was less than 1%. Sixty percent of hardware imports consist of PCs. Israel is following the worldwide trend of "downsizing" the consequence of rapid development of price-performance ratio, software development for distributed processing and networking capabilities. There are about 200 software houses, 85 being members of the Israeli Software Association. Both Business Week and Newsweek, in recent issues, compare Israeli High-Tech Industry with Silicon Valley. Israeli start-up companies developed sophisticated software for verbal communications, 3D graphics, and network security for Internet users. 1. Lack of devaluation of shekel vs the US$. 2. An acute shortage of computer science graduates. As a result of the above mentioned problems, there is a decrease in the profitability of the IT industry in Israel.